A real-time recorder and compressor of audio and video input for the Windows platforms, using MFC, DirectX, FFMPEG and MPEG4IP. The program is capable of generating avi and mp4 files and streaming MPEG-4 audio and video via Apple Darwin Streaming Server. Capturing audio from a sound card using Microsoft Direct-X. 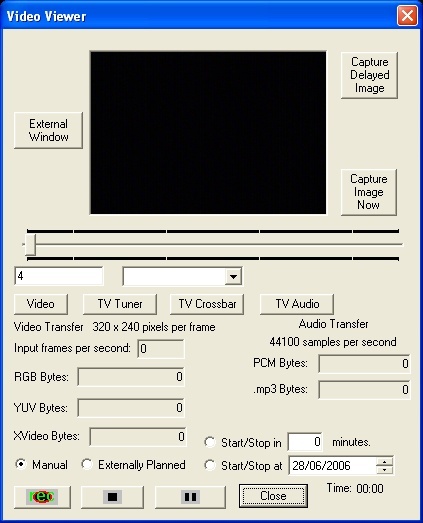 Capturing video from a TV card or a web-cam using Microsoft Direct-X. Compressing audio to either MP3 (MPEG-1 layer 3) or AAC formats using Lame (mp3 compressor) and FAAC (AAC compressor). Writing audio files. Compressing video to MPEG-4 (XVid/DivX) format using FFMPEG or MPEG4IP. Writing AV files: AVI (with code from FFMPEG) or MP4 (with code from MPEG4IP). Scheduling an automatic AV recording. Setup program, compiled using Inno Setup 5. All settings are kept in 'MPEG_Recorder_Settings.xml', no setting is kept in the registry. Keeping and recreating the video routing.